and way back in 2003 we were the only people on the beach on 27th Dec.
and that was the only language we could identify, no English. Seems to be working for the locals though, a lot of trade going on. All these Russians and they all wear T shirts with American slogans or states emblazoned on it. I don't get that, I thought they didn't like the US. Never saw a Russian T shirt. 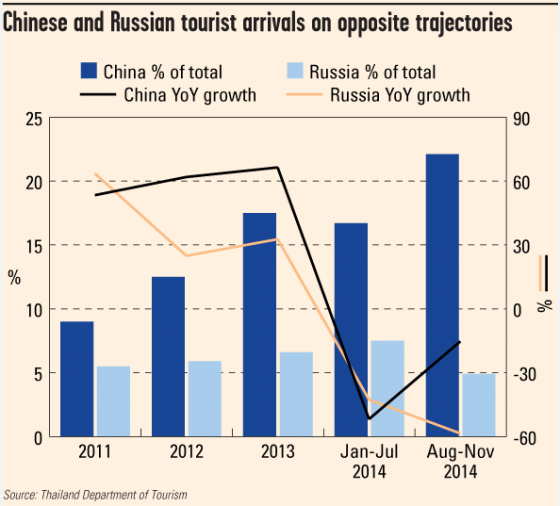 Russians are a big earner for the Thai tourist industry. Arrivals grew an average of 39.4 per cent per year between 2010 and 2013, reaching 1.7m last year, behind only Chinese tourists (4.6m) and those from neighbouring Malaysia (3.0m). More importantly, Russian visitors accounted for $4bn in revenue, 10.1 per cent of total receipts, second only to the $6.1bn from Chinese tourists.On some beach resorts, Russian signs and menus have become as ubiquitous as English ones, especially in Pattaya, where thousands of Russians take up part-time or full-time residence (and where the Russian mafia allegedly controls much of the illicit activity). A cottage industry of condominium sales has sprung up around this demand, feeding what many analysts say is a minor property bubble. A recently observed meeting in a coffee shop on Jomtien Beach, next to Pattaya, revealed a Russian sales agent trying to sell condominium space to a Thai client – a role reversal rarely seen in Thailand. But if the Thai military coup did little to unnerve Russian holidaymakers, the depreciation of the rouble and the accompanying economic slowdown from August to November has had a palpable impact. While arrivals from the rest of the world recovered, the number of Russian visitors fell by an average rate of 21.1 per cent year-on-year for August through November. The plummeting value of the rouble against the US dollar since then is likely to exact an even heavier toll on Russian tourist visits to Thailand, according to Asean Confidential estimates. Tourism is a huge business in Thailand. Last year, the country placed tenth globally in international arrivals with 26.5m, and seventh in international tourism receipts with $42.1bn, according to the UN World Tourism Organisation. The direct contribution of tourism (including domestic tourism) to 2013 GDP measured 9 per cent, a figure that does not include indirect benefits such as retail spending at Central Bangkok’s glitzy malls, where Asean Confidential research suggests that foreigners make some 30 per cent of purchases. Overall, Thailand’s recent political chaos has scared off an estimated 2m visitors at a time when little in the economy appears to be going right. Tourist arrivals from January to November dropped by 8.6 per cent year-on-year, from 24.0m in 2013 to 21.9m this year. They numbers around here are noticeably down on past years, that it why I was surprised tonight. I am sure a lot of Russian orientated businesses are hurting. Sure 20 odd % is a lot from this time last year but even yesterday I was in a shop in Junceylon and everyone in the shop except us were Russian...went for a massage yesterday evening and 6 Ruski's booked in as we finished.....so if numbers do drop a lot more will definitely have a huge effect from what I see on my travels! Just a thanks for those graphs and the text. Very interesting figures that I hadn't seen, very enlightening. If I'm going to be racist, I'll say this: Rather Russians than Indians. All the beaches are more crowded than they were 10 years ago. Lots of Russians around mid week December when i was in Patong. To be honest, i hardly see Aussies around? I wonder whether a number of the Russians have booked, and paid for, their holidays some months (a year?) in advance and hence have decided to go ahead despite the currency crisis. I suspect that there will be a fall off in Russian tourists in 2015 even if there is a partial bounce back for the rouble. soupdragon and Nautilus like this. We've had 8 cancellations from Russians, which does not sound a lot until you consider we only have about 90 properties and we have in the past 7 years only ever before had one cancellation and that was due to the airport barricade, so a very noticeable amount to us. We haven't noticed numbers down because mid Dec to mid March we are fully booked and every year for this period we are fully booked, however not a good test for numbers up or down. The proof to us will be mid March to end April, as we usually fill that period from 1st January. We are expecting low season to be noticeably quieter as the last two years we've had smatterings of Russians throughout the low with 75% occupancy rates during June and July. 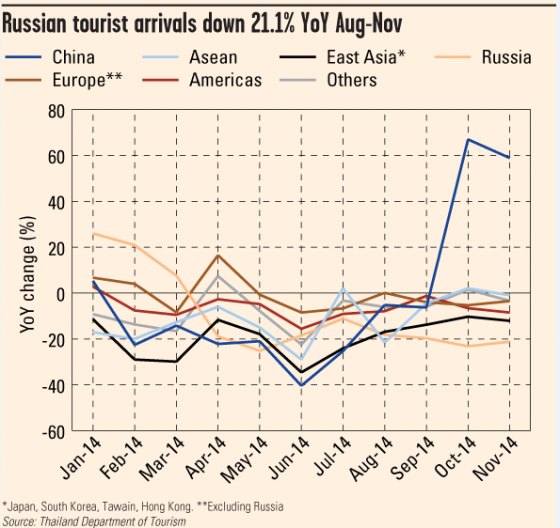 these low season Russians are the poorer demographic, so in my opinion the ones affected most by the falling Rouble. Here's a question - how would you spell Rouble? I've always spelled as Rouble, but kept seeing Ruble recently, wondered if spelling mistake or simply phonetics? Now whilst not helping too much this low season, I've seen an increase of tourists from France, Italy and Scandinavian countries, so fingers crossed they return in numbers over coming years. Also appreciate the graph, never seen that before. It was rammed with Aussies in October. Largely a younger crowd though, what I thought of as the 'Bali demographic', and seemed to be a lot of backpacker/end of season footy tour folks. I thought there were fewer Russians generally around Patong and two of their go-go bars had closed. I assumed this to be because their economy was hurting. Dkdude and TLandHim like this. As far as the dive ops go, I talked with one of the remaining shops about the closures. They said that was mainly due to the rising costs of real estate around Patong. Fortunately All4Diving is still there on Soi Sansabai. I chartered a couple day trips with them in October. I asked him if the ruble drop had given him second thoughts about coming to Thailand. He said, his original trip was to Italy but he had to change to Thailand because he could no longer afford Italy. So it's kinda like rissian and russian then? or is it whether or not you speak english or american?